It's that time of year! We are pleased to offer a hand-lettered gift card with any purchase . . . info below. 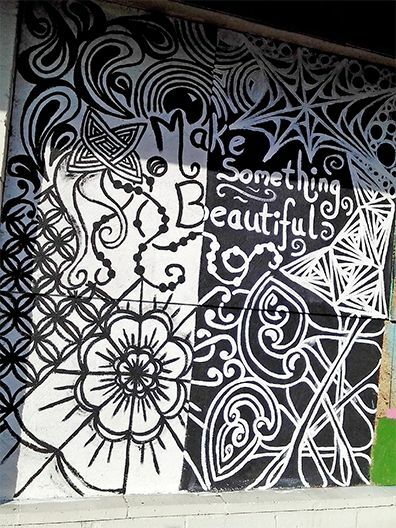 We'll also take this time to share with you some inspiring Zentangle art from around this world. 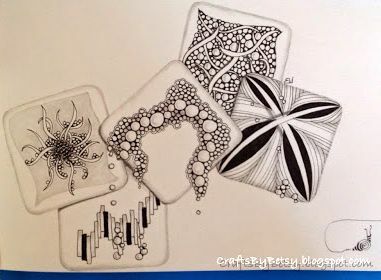 We receive beautiful Zentangle creativity & comments all the time. This is a great opportunity to take a moment out this busy season just to appreciate the outcome of a person's creative energy when it is allowed and encouraged to flow. When you were in Holland last September i joined your workshop. I was one of those people that thought i could not draw. 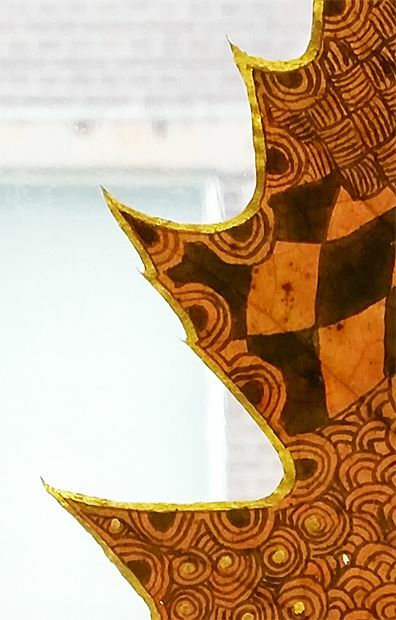 Something in your workshop hit me and i have been practicing the Zentangle Method ever since. 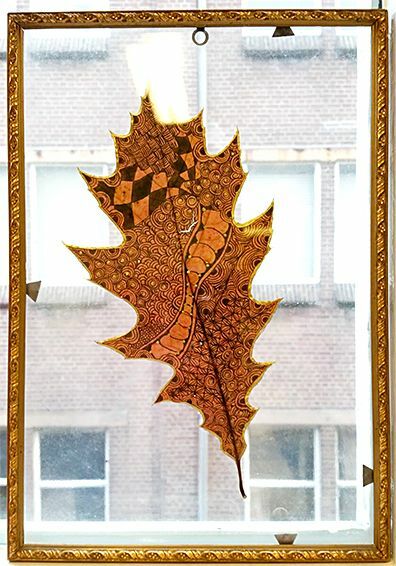 sits on the window-sill in my office. I wanted to tell you that having Zentangle in my life is an enrichment for me. I'm a resident in Ferguson, Missouri. I don't know if you know about all of the unrest my community has been facing over the past few months, but today brought something beautiful. This past Monday night after the Grand Jury announcement, many of the local businesses were broken into, looted and burned. When I drove to work on Tuesday morning I was shocked to see the damage. By that night all of the businesses had boarded up their windows. 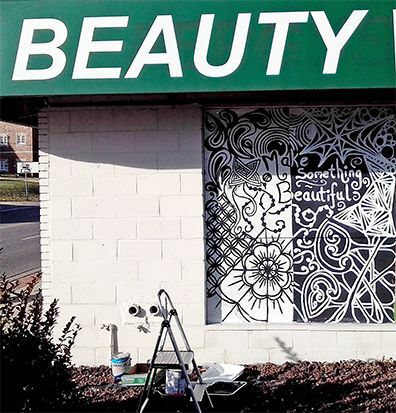 Some inspired artists decided to look at these boarded up windows as an opportunity to beautify and heal Ferguson. For the past 3 days local artists have been out painting murals and messages of hope. I have been practicing Zentangles for the past few years and wanted to share the joy it has brought me with my community. In my heart, though, it was also a way for me to show that black and white can work together to create something more beautiful than any one shade can create on its own. My community is diverse and we are more vibrant because of that diversity. We have the opportunity now to work together to create something more beautiful for our community, for our children, for our future. I have learned that Zentangle is not just art. It's a type of meditation. It's an expression of energy. It's a message of hope. That's what I wanted to share with the community of Ferguson. I wanted to share an image of my painting with you because without your teachings, I couldn't have created such a work of art. Thank you for providing this artform that helps me to work through and express my emotions and thoughts during this transformative time. Bijou has taken to wandering. Sometimes we won't see him for days and then a letter or email shows up. He recently visited Betsy Wilson, CZT. Betsy was kind to send this image . . .
. . . and describe Bijou's visit here on her blog. Primero, quiero contarles que tuve oportunidad de conocer su arte a trav�s de internet y me ha parecido fascinante la experiencia. Soy Colombiana y desde esta latitud, sigo su trabajo a trav�s del bolet�n que me llega de ustedes. Y segundo, les quiero compartir mi trabajo de estos d�as. 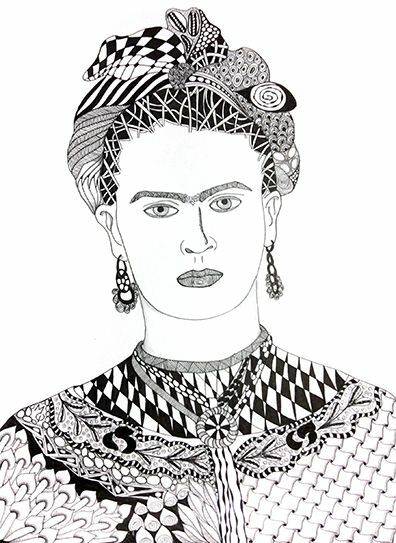 He querido hacer un homenaje a Frida Kalho, pintora mexicana, mi preferida. S� que soy apenas un aprendiz de tan hermoso arte pero lo que hago, lo hago con mucho entusiasmo. Me ha cambiado la vida esta manera tan especial de meditar, relajarme y estimular la creatividad. First, I want to tell you that I had a chance to meet his art through the internet and I found fascinating experience. I am Colombian and from this latitude, continue their work through the newsletter I get from you. And second, I want to share my work these days. I wanted to make a tribute to Frida Kahlo, Mexican painter, my favorite. I know I'm just an apprentice so beautiful art but what I do, I do it with enthusiasm. I changed life is so special to meditate, relax and stimulate creativity manner. Here is my work. Thank you M.Q. I have great news so I have to share this with you!! First of all I have not stopped giving Zentangle courses. I have many students and everyone loves it. I also have a friend that has cancer and when she shaved her head there was a magazine that interviewed her about the illness and she wanted me to draw Zentangle patterns on her head for the photoshooting. She is very beautiful and known to be a great athlete. She is very inspiring to others. I started from a lotus flower because she represents love and survival. Thank you all for sharing these images and stories. We have so many more to share soon! All seminars are now over half full. If you are planning to attend, please register in time to reserve your place. "When I attended the CZT training in October I was a complete novice, but am now a tangling fool!!! "It has been both a humbling and rewarding experience that has made me gain tremendous amount of growth as a person. "I really want you to know how much Zentangle (and you guys) have changed my life. I cannot thank you enough." S.
Once again, thank you so much for enjoying and sharing this amazing Zentangle adventure with us. Bijou is back home during this busy season. He's helping us count tiles for his Tinful of Bijous. So, from all of us and our families to you and your families, our best wishes at this holiday season!